I am honest! I am not the biggest chocolate fan. But my hubby and my brother loves chocolate so I made these choc beauties last weekend and love them! Normally you think chocolate can’t be healthy but that is wrong. If you use healthy ingredients and non raffinated sugar you can bake really healthy muffins which are so delicious. 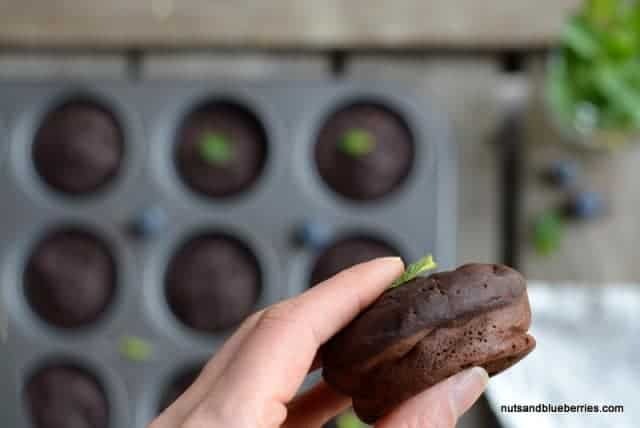 This vegan chocolate muffin recipe is one of the easiest I create in the last weeks. I like to make more easy food because I spend often so much time in the kitchen and sometimes I really need easy recipes. The base of this muffins is raw chocolate powder. Raw unprocessed dark chocolate is full packed with health benefits. The raw cacao powder is made from cacao beans. Please please please use organic cacaos because a lot of humans are in slavery because of the cacao production. I watched a German movie about cacao slavery. I will never buy NON organic cacao or chocolate any longer! The cacao bean is full of antioxidants and good fats. Also you find good protein in it and minerals like calcium and magnesium. I used spelt flour for these vegan chocolate muffins but you can easily use buckwheat flour if you like. Preheat the oven on 170 degrees. Add the 3 dry ingredients into a large bowl. Mix up the bananas with the almond milk and dates. Add the liquid to the flour and mix well and remove any lumps. Share the mixture into 12 muffin forms.